John Deere is a brand of Deere & Company and is the leading manufacturer of agricultural machinery in the world. John Deere products are known for their distinctive green and yellow color scheme, as well as the companies logo of a deer. From very early on the company added their logo to merchandise and ephemera which today provides collectors with a massive range of historical material to collect, covering a period of over 170 years. Pictured right: ERTL® diecast replicas showcase period-accurate John Deere graphics and logos. 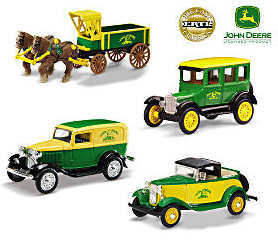 Includes the “John Deere Delivery with Horse and Wagon,” and the imaginative “1913 Ford Model “T” Delivery Van”. There is also a huge array and variation of modern collectibles ranging from die-cast models and toys to Disney tie-ins and from Beer Steins to whole model displays. Pictured left: a limited-edition collectible John Deere Model “B” stein crafted of quality glazed porcelain and decorated with signature green and yellow John Deere colors and shiny 22K-gold accents. The tractor’s memorable features and years of production are showcased on the reverse side. Collectors also vary in their approach and range from those intrested in early agricultural machinery and the history of farming in the US, to those interested in collecting all the various die-cast mod el tractors ever produced, to those collecting actual company memorabilia and ephemera etc. 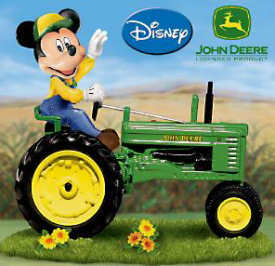 Pictured right: Farm Magic Mickey Mouse and John Deere Tractor Figurine – Mickey Mouse sits atopa spiffy Model B John Deere tractor featuring authentic engine detailing, trademark yellow wheels and intricate detailing from top to bottom. NOTICE – This site is not affiliated with John Deere. 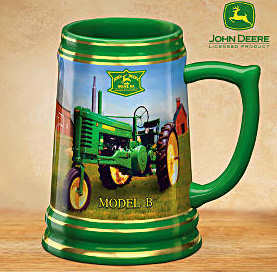 The purpose of these pages is to provide information to collectors of John Deere Collectibles.